When my mom began homeschooling me, there were only a handful of homeschool curriculum choices available. Now, 30+ years later as I’m homeschooling my own three kids, homeschool curriculum choices fill huge convention centers and flood the internet. While all those choices provide a fantastic opportunity for customized learning, those same choices also lead to a lot of anxiety. What if I make the “wrong choice”? Where do I even begin? What if my homeschool curriculum choice makes our learning challenges even worse? Though there may be no way to eliminate all of our fears, there are a few tips for conquering our fears about homeschool curriculum. 1. Start somewhere. If you are just getting started, there is something to be said for just jumping in. 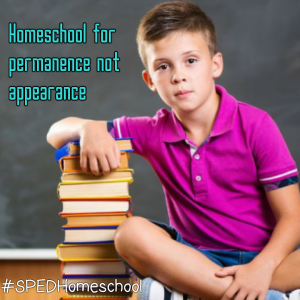 Realistically, you won’t know what you like or don’t like, what you need or don’t need until you’ve been homeschooling for awhile. Most homeschool curriculum choices will cover what needs to be covered. Just choose one and jump in. If it helps, plan for your first year to be a year of experimenting: trying out different approaches, teaching styles, and learning methods. Take notes. Keep a journal of what you like and don’t like. 2. Remember there is no perfect curriculum. Most of our fears about homeschool curriculum stem from this one myth: that the perfect curriculum is out there somewhere, and it’s our job to find it. Like a needle in haystack we try different products, always hoping for that elusive “perfect one” that will meet all of our needs and expectations. It doesn’t exist. Every homeschool curriculum choice has pros and cons. Instead, find a curriculum that has most of what you love and make adjustments along the way when things aren’t ideal. 3. Approach curriculum choices with a growth mindset. A fixed mindset sees failure as the end, but a growth mindset sees failure as a single step in the learning process. Even the “wrong” curriculum teaches us something. If you’ve purchased a homeschool curriculum that is absolutely the wrong fit for you and your family, you’ve learned something about yourself, about your child, about your family, about what your priorities and most urgent needs are. Every decision you make, for better or for worse, teaches you something about yourself and about your child. Learning these things is not a failure; it’s an important part of growth. 4. View curriculum as a tool, not a master. You teach your child, not a curriculum. You lead, and the curriculum follows. You create the IEP goals and select the best tools to help you meet those goals. Curriculum is simply one tool in your homeschool toolbox. 5. Don’t expect a curriculum to solve your problems. Your homeschool curriculum choice may help you to create some fun learning memories with your child. It may lead you on great adventures and help your child to overcome some of her challenges. But we can’t expect one product, one therapy, or one person to be the final solution. Only God can meet our needs in that way, and He is sovereign over every choice and circumstance, capable of using it all for our good and His glory. Your homeschool curriculum decision cannot thwart His plan for your child or for your family. But He will use both the best and the worst of your homeschool year to shape you and your child into His image. 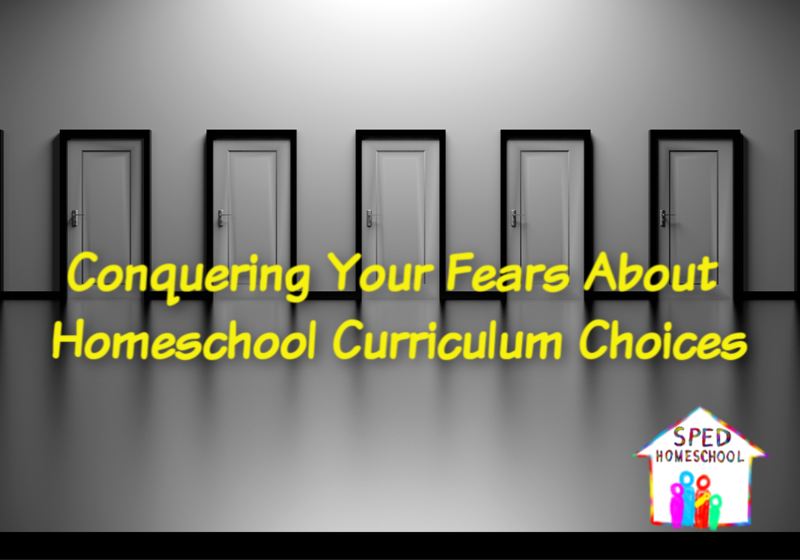 How do we conquer our fears about homeschool curriculum choices? We realize that no decision is final, no failure is permanent, no choice can overturn God’s good plan. When we trust Him for the outcome, any homeschool curriculum can be the right one. We’ve just got to take the first step and keep moving forward. We all want our kids to enjoy reading, to know what it feels like to get lost in a book, but for many of our kids with disabilities and reading challenges this dream seems a pretty lofty one. 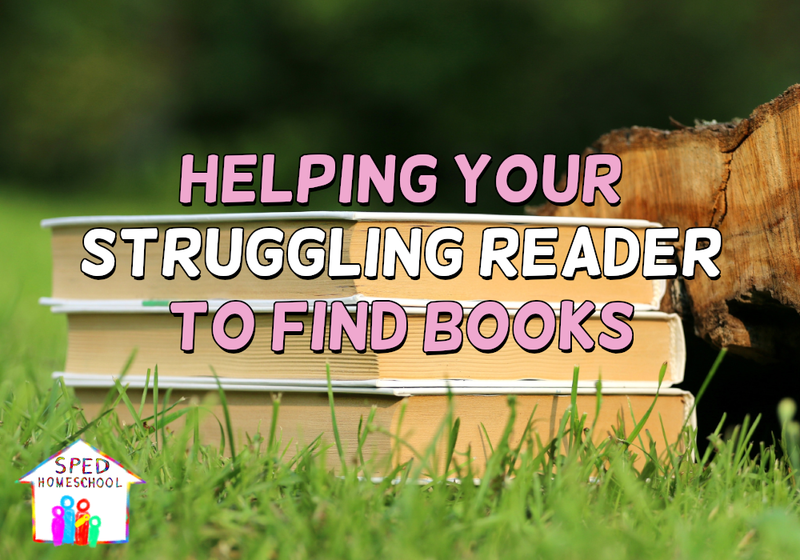 While there is no one-size-fits-all for struggling readers, here are a few resources for helping your struggling reader to find books that he or she can enjoy. Using the Lexile Score book finder tool, you can search for books that fit both your child’s interests and abilities. The book finder provides information about the book, targeted vocabulary based on your child’s reading ability, and the expected comprehension for that particular book. For more information on how to use Lexile, read Using Lexile Scores to Help your Struggling Reader. For some kids, the challenge of reading lies in being able to track the words across the page and from line to line. As reading levels get progressively challenging, the words shrink on the page, and pages are filled with more and more text. Visually, this can be a real challenge for our struggling readers. Ebooks offer a simple solution. Ebooks, in all of their different formats and devices, allow the reader to adjust the font size, the background, and various other settings. In this way, the child can adjust the words on the page to fit his comfort level while attempting a more challenging reading level. Additionally, some ebook resources, like Bookshare, also provide a gradient text that changes colors from line to line, allowing your child to more easily track from one line to the next. As parents and educators, we tend to think of eye-reading as the only form of reading. While it’s a great goal to get our children reading books for themselves, there is also tremendous value in ear-reading or audiobooks. The elements of a story, the skills of comprehension, and the nuances of language can all be taught with an audiobook. There is also an advantage to separating these skills from the skill of eye-reading, allowing your child to work one skill area at a time. Don’t underestimate the importance of introducing different genres. Just as we wouldn’t assume that a child that hates one vegetable will hate them all, we can’t assume that a child that hates one type of book will hate them all. Some children prefer fantasy, getting lost in a different world or time; but for other children, particularly those with reading challenges, the foreignness of a fantasy world can add to the challenge of reading and understanding. Try realistic fiction, nonfiction, or historical fiction from a time that your child especially enjoys. When introducing a new genre, choose a book slightly below your child’s reading level. Make it as accessible as possible until the child’s interest is piqued. Once your child finds a genre he or she really likes, your child will be more willing to attempt a higher reading level. But be sure to baby step and take one challenge at a time. Just because a child has dyslexia or another reading challenge, doesn’t mean that child can’t enjoy the world of literature and great books. Our kids can still get lost in a book, but we may have to adjust our expectations of what that looks like.